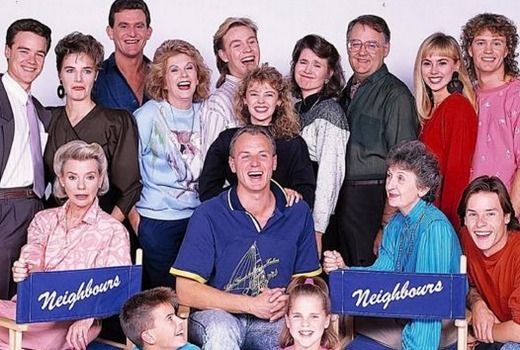 March 18th 2015 marks 30 years to the day when Neighbours first aired on Australian Television. To mark the occasion, TV Tonight recently posed some questions to its creator, the legendary Reg Watson. Congratulations on the show reaching 30 years. You must feel very proud of this achievement? Yes, I’m very proud but also grateful to so many hundreds of talented people who worked to make the serial a success. Take us back to the start. How did the idea come about? The concept was based on life in my home street in Brisbane before I went to England. When I returned in seventy four I was surprised at the changes in the people; the happy neighbourly atmosphere had gone and there no longer seemed to be the bond between parents and teenagers. Today, when asked how things went at school teenage sons would grunt an answer. I thought it would be interesting to do a serial where modern viewers could be reminded of the ‘old days.” ie. Scott Robinson and his father trusted and respected each other and communicated as adults but Max Ramsay couldn’t stand his rebellious son. Those were the days when all neighbours knew and helped each other in the street but now they are insular. Everything is different again today but older people will remember what I mean about the old days -but you can imagine trying to pitch a serial about communication to a sceptical channel executive with their arms folded – as they do. What about when it was axed by Seven and picked up by TEN? Ian Holmes (Grundys) handled the switch from Seven to Ten. I was flat out rewriting new storylines and scripts for Ten. People often refer to the glory era, of UK success, fan frenzy in shopping centres. It must have been quite a ride? I knew all about the impact Neighbours was having on the great British public but only experienced it myself in the most unlikely place – Heathrow airport immigration. I had flown in and a rather superior official was checking my passport etc. He looked me up and down and said, “So you’re a television producer. And just what do you produce, Mr. Watson?” I mentioned that something I had devised was currently running over there and mentioned Neighbours. His reaction was amazing as he begged for an autograph for his wife (or she’d never forgive him) and brought two buddies over to meet me. It was fun being a VIP for a few minutes but Neighbours actors copped the full force of fan frenzy when they went to the UK – and they loved it. Neighbours was running twice a day on the BBC. When did you step back from the show? I stepped back from the serial when Reg Grundy sold the business but it was already being run by experts so I retired a happy man. Why are audiences so drawn to soap opera? As you know yourself, the success of a serial always starts with the storyline. If an episode doesn’t contain a logical plot with interesting characters and a strong cliffhanger viewers lose interest. Storyliners hold the characters’ lives in their hands. Tell us about your lifestyle now. What keeps you occupied? Do you still watch the show? My lifestyle is now completely different. I had over sixty years in theatre, radio and television and you must make a determined effort to give it all up and not look back- otherwise you will be the doddering old ‘know all’ who keeps interfering. That’s not my style. What will be Neighbours’ legacy? 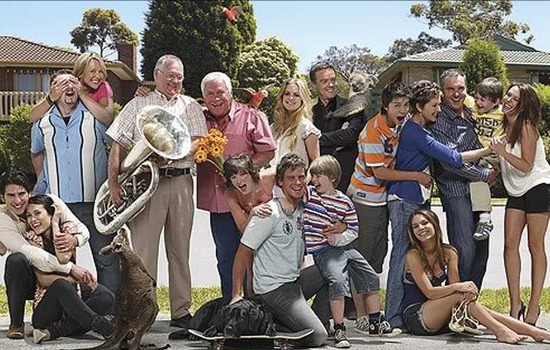 The Neighbours legacy. Well, I produced the first five day a week serial, Crossroads in the UK. Critics hated it and Lady Plowden, the Chairman of the powerful Independent Broadcasting Authority wanted it off the air because she found it to be ‘’”distressingly popular.” That was fifty years ago and today in Britain they are still running repeats of the serial and fans are gathering to celebrate the anniversary. I’d like to think that people will still feel the same way about Neighbours in fifty years’ time. The photoshop on that photo is so bad. The grey between Harold and Lou doesn’t match up with the kerbside between Susan and Karl. I’ve never seen that cast pic from the bottom. Is that a Koala on Pauls back? I don’t remeber him in the show, but I probably wasn’t watching a lot during that period.